Add chicken to the bottom of your slow cooker. Whisk together all of the Mongolian Sauce ingredients and pour 1/2 cup over chicken. Refrigerate the rest of the sauce. Cook on low for 5-7 hours or on high for 3-4 hours, or until chicken is tender enough to shred. When chicken is tender, remove to a cutting board and shred. Meanwhile, add reserved Mongolian Sauce to a small saucepan and whisk in 1 1/2 tablespoons cornstarch followed by all the liquid from the slow cooker. Bring to a boil then reduce to a simmer until thickened. 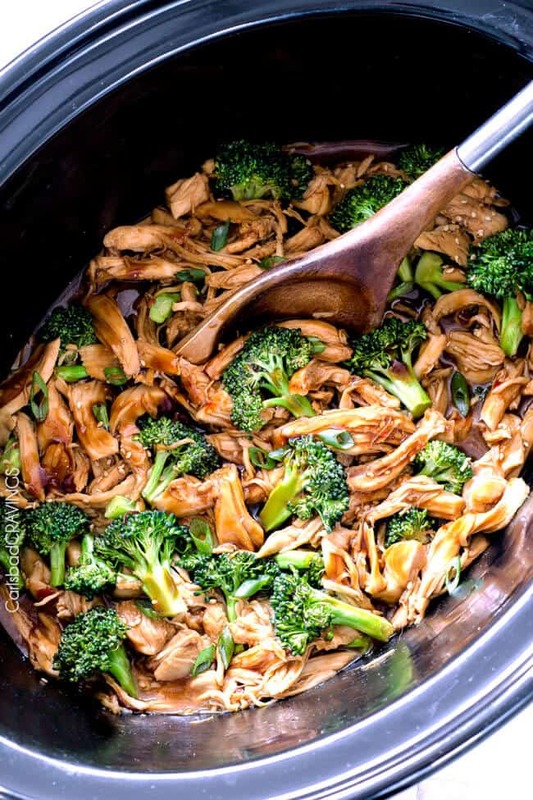 Add shredded chicken back to slow cooker along with thickened sauce. Toss to combine. Let cook an additional 30 minutes on low to absorb sauce. Add salt to taste. Add additional Asian Sweet Chili Sauce for more sweet heat, Sriracha for spicier, brown sugar for sweeter if desired. Serve with rice and garnish with sesame seeds and green onions. **Customize heat: If you aren’t sure how much Sweet Chili Sauce to use, start with less and stir in more at the end of cooking. I use 4 tablespoons (1/4 cup) and 1 teaspoon sriracha and I would say it is medium spicy. If you have young children you will want to start with 2 tablespoons Asian Sweet Chili Sauce and probably omit the Sriracha. ***Rice wine: I use Kikkoman Mirin Aji Sweet Rice Wine – can be found in the Asian section of most grocery stores – I suggest googling it so you can spot it easily. The best substitute is dry sherry. ***Broccoli: I added 3 cups broccoli florets by adding 1/2 inch water to a microwave safe bowl along with broccoli, covering and microwaving for approximately 3 minutes to steam.